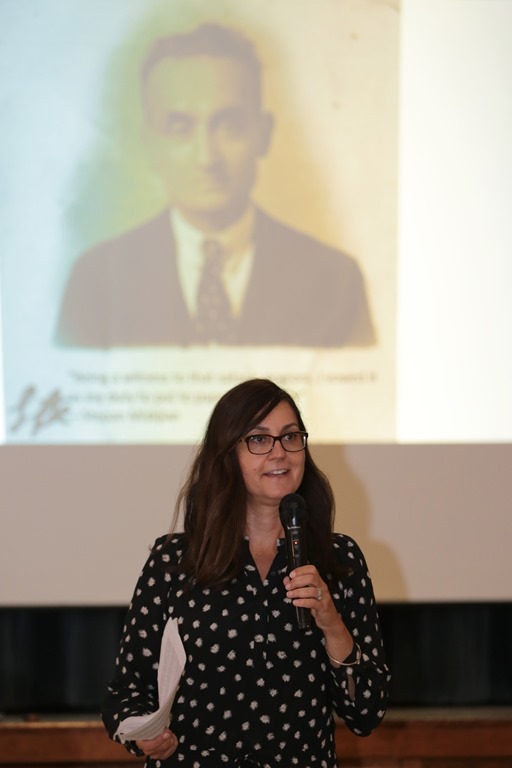 (Greenfield, Wis.) Dawn Anahid MacKeen grew up hearing her mother’s stories about her grandfather, Stepan Miskjian, a Genocide survivor who immigrated to America. “As a child, I was repulsed by some of those stories,” she said, speaking at St. John the Baptist Armenian Church at a Sept. 17 event ahead of Armenian Cultural Month in October. If sometimes repulsed, she was always curious. “’It’s all in here!’ my mother said, pointing to a pair of small booklets, in Armenian, published by my grandfather in the 1960s.” This led to the discovery of a cache of his notebooks, meticulously penned in grandfather’s careful handwriting, setting down his life from before and through the Genocide. Grandfather’s writings became the basis for MacKeen’s book, The Hundred-Year Walk: An Armenian Odyssey. Called a “must read” by the New York Post, The Hundred-Year Walk reframes his memoirs and recounts her own journey to Turkey and Syria in 2007. She retraced his steps from his hometown in Adabazar (now Adapazari), east of Istanbul, to the Syrian city of Raqqua on the Euphrates River. Having escaped his death march through the Syrian desert, he was given sanctuary by a Bedouin leader, Sheik Hammud al-Aekleh, who sympathized with the plight of the Armenians. Like her grandfather, MacKeen has a gift for reporting. An award-winning investigative journalist, her work appeared in the New York Times, the Los Angeles Times, Newsday and Smart Money. She put her career on hold to write The Hundred-Year Walk, expecting to devote two years to the undertaking. In the end, the project required 10 years to complete. She devoured published and unpublished accounts of the Genocide and traveled to Armenian libraries in Paris and Vienna. Her journey to the Near East occurred at a time, not so long ago, when Turkey sometimes seemed on the verge of opening up to the world and Syria was a stable nation. Many of the places she visited, including the Genocide Memorial at Deir Zor, have since been destroyed. MacKeen’s greatest joy was in locating the descendants of the sheikh who protected her grandfather. “Raqqa later became the capital for ISIS, but then, it was a harmonious place of many religions and ethnicities,” she said. “I received great hospitality and couldn’t help but think of the ripple effect of one kind act—because of the sheikh, my family survived.” According to MacKeen, many of the sheikh’s descendants have fled the Syrian civil war and become refugees in Europe. MacKeen’s talk and the lively questions and answers that followed capped a busy day at St. John. The Exaltation of the Cross, a feast day on the Armenian liturgical calendar, was celebrated by the traditional Blessing of the Four Corners of the World service and the distribution of basil. St. John added a new member to its community with the baptism of Ava Torosian, daughter of Jeff and Jennifer Torosian. A luncheon hosted by family members followed the baptism and gave the visiting speaker a sense for the genuine fellowship found at St. John.